NYC, 04/23/2019, 6:00PM. First Man (2018): Story Of The First Person To Walk On The Moon Starring Ryan Gosling. 141 min. Director: Damien Chazelle. Starring Ryan Gosling, Claire Foy, Jason Clarke. First Man received four Academy Award nominations for Best Sound Mixing, Best Sound Editing, Best Production Design, and Best Visual Effects at the 91st Academy Awards. 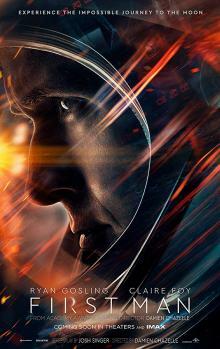 It is based on the book First Man: The Life of Neil A. Armstrong by James R. Hansen. First Man grossed $44.9 million in the United States and Canada, and $55.6 million in other territories, for a total worldwide gross of $100.5 million, against a production budget of $59 million.